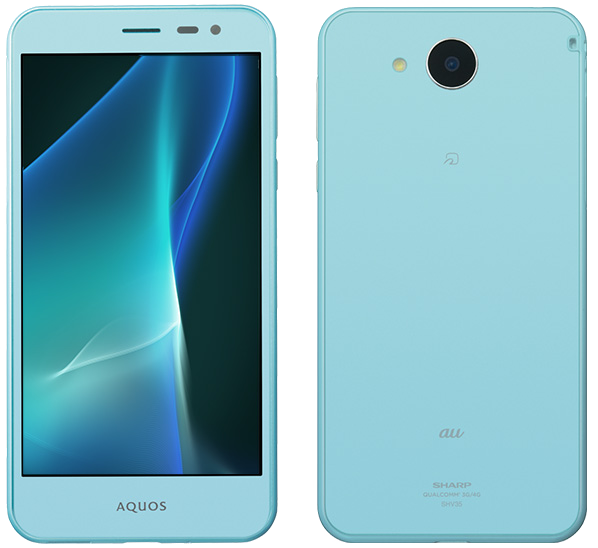 Alongside the flagship Aquos Serie SHV34, AU and Sharp are also releasing a smaller version of the new iPhone-knock-off design smartphones, and also branching out a new series called the Aquos U. The Aquos U SHV35 is equipped with a 5-inch IGZO screen with a lower, HD (1280 x 720 pixels), resolution, and with the advanced S-PureLED backlight. That, coupled with a 3,010 mAh battery, should easily ensure anywhere above 3 days autonomous work in one charge. The SHV35 relies on the latest Qualcomm Snapdragon 617 processor (MSM8952) that has 4 x 1.5 GHz cores and 4 x 1.2 GHz cores - fine-tuned by Sharp to suppress heat generation and power consumption - and with the Adreno 405 GPU for high graphics processing capabilities and 3D games. The RAM is 2 GB, and the ROM 16 GB, expandable using microSDXC cards (max. 200 GB). The camera uses the previous-generation 13.1-megapixel CMOS sensor only enhanced with the new software found on the Summer 2016 collection flagships. It is not, however, the GR-certified sensor, although supposed to be faring pretty well in low-light conditions, also furnished with the Capture Later feature, which allows recording a short video clip (7.5 frames/sec in 4K2K resolution) that can later be decomposed into frames and the desired best shot captured as a photo. The inner camera has a 5-MP wide-angle sensor (85 degrees). It also has the Skin Correction feature where the software will automatically recognise a human face, detect the spores, and "fix" them by smoothing the skin. The inner camera also has the Hand Mirror mode where it will work at 60 fps to act as an actual mirror. The Aquos U SHV35 comes with an improved UI thanks. Twist Magic allows you to twist the phone (rotate it about 90 degrees and back while holding it) to switch between working applications. An auto scroll feature has been added, too: you can start automatic scrolling of content by pressing your finger onto a dedicated icon. Also available is the Clip Now feature, previously only found on the Aquos Crystal models - slide your finger left to right on the top edge of the display to capture a screenshot. Further extras include the Feel UX, display-off when putting the phone in your pocket, and a small display window in case the phone is used with a book-type case. A new feature one is sure to notice is Relax Auto: the display will reduce blue light to fight eye fatigue. The phone's AI engine will learn your sleeping habits and adjsut backlight and screen refresh rate accordingly to help you fall asleep easier. More details on the study and trials here (in Japanese). The SHV35 is waterproof (IPX5/8) and dustproof (IP5X) - capless. The design is very similar to the bigger brother: a metal strip goes around the entire side of the phone, and the rear is cast in a flat matte texture panel to prevent fingerprints. The SHV35 does not appear to have a LED indicator, unlike all previous Sharp models. It is offered in int blue, silky white, and elegant black. Its dimensions are 141 × 71 × 8.3 mm, and it weighs about 128 grams. The Aquos U SHV35 only supports 4G LTE (700 MHz, 800 MHz, 2 GHz) / WiMAX 2+ connectivity plus VoLTE. Supported 3G frequencies include 850 MHz and 2GHz, and the supported GSM bands are 1.9 GHz, 1.8 GHz, 900MHz. Supported Wi-Fi protocols include b/g/n. Bluetooth is version 4.2. No infrared. No digital TV either (One Seg or Full Seg). It has, however Mobile Wallet/NFC and Quick Charge. Originally released with Android 6.0, the Aquos U SHV35 received an upgrade to Android 7.0 on 13th April 2017. On 4th July 2018, an upgrade to Android 8.0 rolled out.